It's now a signed law as Pres. Rudy Duterte signed the measure extending the VALIDITY of PASSPORT from 5 years to 10 YEARS. It will take effect, 15 days after its publication in the Philippine government's OFFICIAL GAZETTE. 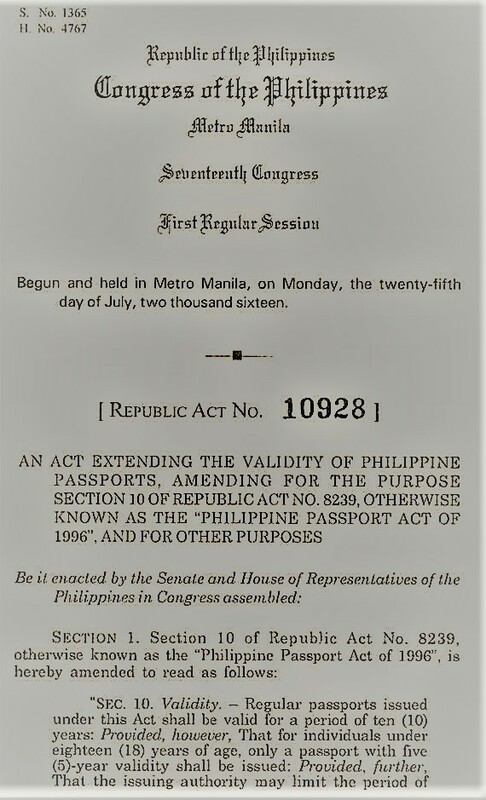 President Duterte signed the Republic Act 10928, an act extending the passport validity and amending section 10 of Republic Act 8239 or the Passport Act of 1996. However, under Section 10 of the Act, individuals, or those under 18 years old or minors will have a passport validity period of 5 years. House Bill No. 4767, is a measure seeks to amend Republic Act No. 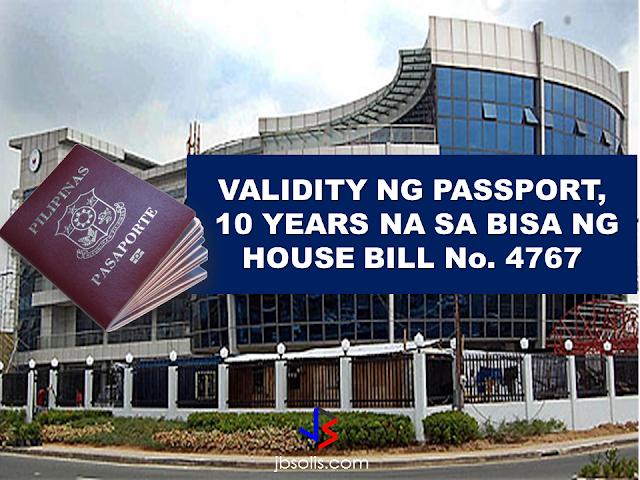 8239, or the “Philippine Passport Law,” which currently states that a passport is valid for a period of five years, regardless of the age of the applicant. Under the bill, the validity will be extended to 10 years for adults, or those 18 years old and above. It states, however, that the issuing authority "may limit" the period of validity to less than 10 years in the case of minors, or "whenever the national economic interest or political stability of the country" makes it necessary. The bill will be transmitted to Senate for concurrence. One of the principal authors of the new passport bill is former president and Pampanga Rep. Gloria Macapagal-Arroyo, who now sits as a deputy speaker. The extension of passport validity from 5 years to 10 years is one of the promises made by President Rodrigo Duterte to the OFWs to lessen their burden of standing in long queues just for applying and renewing of their passports.